Boart Longyear designs, develops and manufactures anchor drilling rigs and drilling accessories for a variety of specialist ground engineering applications. Numerous patents, particularly in the area of drilling accessories, are proof of the strength of their powers of innovation and technical competence. Boart Longyear's equipment range include: hydraulic drilling equipment, hydraulic rock drills, rotary drives, drilling accessories, high pressure injection systems. 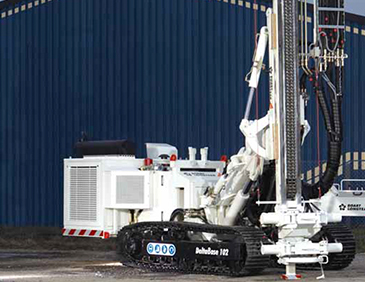 The DB 102 is a universal rig for drilling anchor holes and taking soil analysis samples. When installing anchors, it is capable of drilling down to the depth of 100 meters at a diameter of 178 mm.